I was so intrigued by the description and the cover of Chris Fabry's newest novel that I knew I just had to read it! 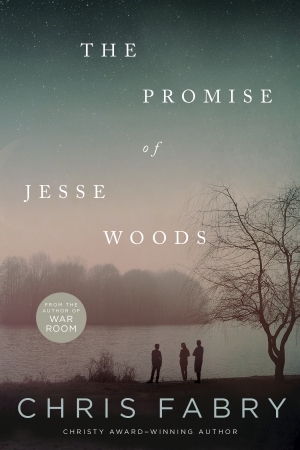 "The Promise of Jesse Woods" is a fantastic read and one that you will devour and be left thinking about it long after you read the last page. Matt moves with his family to West Virginia as a young teen when his father becomes a pastor of a church there. Matt forms a tight friendship with a boy Dickie and a girl Jesse. As they spend time together, feelings deepen and they all learn about each other's lives, even parts that are part and they wish they had not learned. Chris begins this book years later thought when Matt receives a phone call from Dickie with news of Jesse and Matt is compelled to return to West Virginia to see her while he still has the chance to. Chris writes the story alternating from the past (in the 70's) to the present day of the story which is October of 1984. I loved this style as it really built up the mystery of the story and promises and events that occurred years earlier. The characters and their experiences and stories reminded me of some of Lisa Wingate's books and some of her characters. I have a soft spot for people living in difficult situations and overcoming that and just having the hope of arising above the past as I work as a social worker with at-risk children and this story really tugged at my heart. I highly recommend this book, it is a thoughtful read that you will not be able to put down. Is it your husband's job to make you happy? a new addition to your game night!